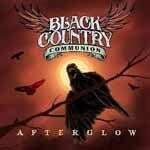 RockUnitedReviews: BLACK COUNTRY COMMUNION: "Afterglow"
Glenn Hughes aka The Voice of Rock? He's got one of those voices you either love or hate? Or at least that's what people keep telling me? I never quite understood their point of view(s) and especially not the haters? Anyone with a tiny bit of sense would surely appreciate the vibrato and close to perfect (soul) phrasing of absolutely everything he's ever done. Then again, not that strange all considering that some folks do not even appreciate female vocalists in metal or elsewhere for that matter... and they surely must be completely bonkers.